Ripple just published its Q4 2018 XRP Markets Report, showing that despite the bad behavior of the crypto markets, 2018 was a good year for the company. According to the report, Ripple sold a total of $129.03 million in XRP. This amount is obtained by adding 88.88 Million “programmatically” sold by Ripple and 40.15 Million sold by XRP II, LL (a subsidiary of the company registered as a licensed money service business) mostly to institutional investors. This amount represents 24.09% of the total XRP sold by the company during that year, demonstrating that the company’s performance was within the expected figures. The company also reports that during Q4 3Bn XRP were released from the company’s escrow account; however, 2.4 Bn were relocated into new escrow contracts. The team mentions that the rest is being used for various activities that will contribute to the growth of the company. Another important aspect highlighted by the company is that the average XRP daily volume was $595.7M, an increase over the previous two quarters. Similarly, despite the market behavior, the volatility of the XRP token decreased while the trading volume increased substantially. 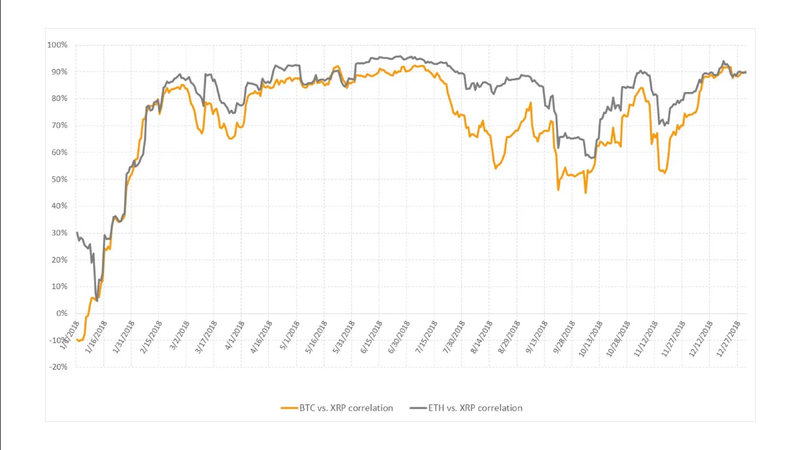 The firm also mentions that by the end of the year, XRPs correlation with the most important cryptos returned to levels observed in the previous periods, evidencing the strength of the token in the global market. XRP was listed in 30 new exchanges at the end of 2018. As a result, the token is available in over 100 cryptocurrency exchanges around the world. Similarly, XRP is steadily becoming a market reference, being accepted as a base pair in 3 new exchange houses. It is important to note that Binance, the world’s largest digital asset exchange according to coinmarketcap data was also one of the platforms that added XRP as a base pair. Until now you can only trade with the pairs XRP/TRX and XRP/XZC. Currently, XRP is the altcoin with the highest market cap according to Coinmarketcap data. At the time of writing, XRP’s total capitalization is 13,082,200,395, which represents more than 700 million dollars over its immediate competitor, ETH, which has a capitalization of 12,301,681,235.